Since the first edition in 1948, Patty’s Industrial Hygiene and Toxicology has become a flagship publication for Wiley. In the course of its nearly six decades in print, it has evolved into a standard reference for the fields of occupational health and toxicology. The volumes on Industrial Hygiene are cornerstone reference works for chemists, engineers, toxicologists, and occupational safety personnel. Volume 1 covers Introduction of Industrial Hygiene and Recognition of Chemical Agents. In addition to revised and updated chapters, a number of new chapters reflect current technology and concerns. The chapters include Nano-Materials, Chemical Toxicants including endocrine disruptors, Exposures in a Multicontaminant Environment, and Real Time Assessment for Contaminants. Vernon E. Rose is a Professor Emeritus in the School of Public Health at the University of Alabama at Birmingham. During 11 years at NIOSH prior to his tenure at UAB, Dr. Rose directed the Criteria Documentation and Standards Development program and helped OSHA develop industrial hygiene programs. Dr. Rose has served as Editor-in-Chief of the Applied Industrial Hygiene journal (now Applied Occupational and Environmental Hygiene), Secretary-Treasurer of the American Conference of Governmental Industrial Hygienists, Chairman of the American Board of Industrial Hygiene, and is a Past President of the American Industrial Hygiene Association (AIHA) and the International Occupational Hygiene Association (IOHA). Barbara Cohrssen is President of Cohrssen Environmental, Inc. and is a Certified Industrial Hygienist and Registered Environmental Assessor. 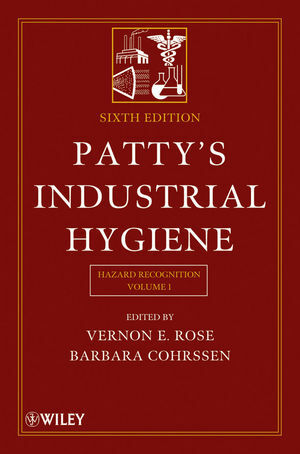 She co-edited the 5th Edition of Patty's Toxicology and is a recognized authority in the field of industrial hygiene. She has over 30 years of experience in occupational and environmental health and safety. In addition, Ms. Cohrssen is a member of the American Industrial Hygiene Association (AIHA), American Conference of Governmental Industrial Hygienists (ACGIH), and American Academy of Industrial Hygiene (newsletter editor since 1994). PART I INTRODUCTION TO INDUSTRIAL HYGIENE. 1 Industrial Hygiene: Retrospect and Prospect—Hippocrates to Nanotechnology (John A. Pendergrass, PE, CIH (Retired), CSP). 2 Rationale for Industrial Hygiene Practice (Robert L. Harris, Ph.D., CIH (Retired); Lewis J. Cralley, Ph.D., CIH (Deceased); Lester V. Cralley, Ph.D., CIH (Deceased); and Vernon E. Rose, DrPH., CIH, CSP, PE). 3 The Mode of Absorption, Distribution, and Elimination of Toxic Materials (Franklin E. Mirer, Ph.D., CIH). 4 Occupational Epidemiology: Some Guideposts (John F. Gamble, Ph.D., MA, MSPH). 5 Atypical Human Response to Low-Level Environmental Contaminants: The Problem of Multiple Chemical Sensitivities (Mark R. Cullen, MD). 6 Basic Aerosol Science (Parker C. Reist, ScD, PE). 7 Pulmonary Effects of Inhaled Mineral Dusts (David Fishwick, MD). 8 Assessment of Exposure to Respirable Dusts (Ronald S. Ratey, Ph.D., CIH (Retired)). 9 Man-Made Mineral Fibers (Jaswant Singh, Ph.D., CIH and Andreas Wagner, CIH). 10 Engineered Nanomaterials (Thomas M. Peters, Ph.D. and Vicki H. Grassian, Ph.D.). 11 Sampling and Analysis of Gases and Vapors (Martin Harper, Ph.D., CIH, CChem, MRSC). 12 Analytical Methods (Robert G. Lieckfield, Jr., CIH). 13 Biological Monitoring of Exposure to Industrial Chemicals (Michèle Berode, Ph.D.; Pierre-Olivier Droz, Ph.D. (Deceased); and Michel P. Guillemin, Ph.D.). 14 Odors: Measurement and Control (Amos Turk, Ph.D.; Angela Merlo, MD, Ph.D.; and Samuel Cha, MS).